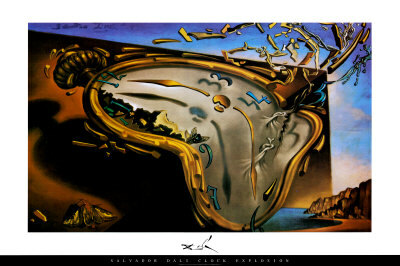 Flamboyant and groundbreaking Spanish artist Salvador Dali is considered one of the 20th century’s greatest artists. An icon of the Surrealist movement his blend of eccentric perspectives and controversial influences resulted in wildly imaginative, unforgettable dreamscapes that are uniquely Dali. Inspired by Freud, Dali accessed his subconscious to create more intense artistic expression. Creatively prolific, he produced 1,500 paintings, along with sculptures, drawings, films, clothing and jewelry. Salvador Dali was born on May 11, 1904 in the small agricultural town of Figueres, Spain. Figueres is located in the foothills of the Pyrenees, only sixteen miles from the French border in the principality of Catalonia. The barren landscapes and fantastic rock formations of this region would appear time and again in Dali's artwork. The son of a prosperous notary, Dalí split his boyhood between Figueres and the family's summer home in the coastal fishing village of Cadaques where his parents built his first studio. As an adult, he made his home with his wife Gala in nearby Port Lligat. His love of this area of Spain was also reflected in his paintings. Recommended books on Salvador Dali: Salvador Dali 2v by Robert Descharnes and Gilles Neret; Dali (Mallard Fine Art Series) by Paul Moorhouse; Dali: The Salvador Dali Museum Collection by Robert S. Lubar; The Secret Life Of Salvador Dali by Salvador Dali and Haakon M. Chevalier; The Persistence Of Memory: A Biography Of Dali by Meredith Etherington-smith; Salvador Dali's Dream of Venus: The Surrealist Funhouse from the 1939 World's Fair by Ingrid Schaffner. Available here are these Salvador Dali posters and prints, among others: The Elephants, c.1948 Posters by Salvador Dali; The Ship Posters by Salvador Dali; The Persistence of Memory, c.1931; Person at the Window; The Metamorphosis of Narcissus, c.1937; Female Figure with Head of Flowers, 1937; Soft Watch at the Moment of First Explosion, c.1954; Galatea of the Spheres, 1952; Dream Caused by the Flight of a Bee around a Pomegranate, c. 1944; The Temptation of St. Anthony, c.1946; Landscape with Butterflies Prints; Rose Meditative, c.1958; Cinquenta, Tigre Real; Idylle Atomique; Christ of Saint John of the Cross, c.1951; The Burning Giraffe, c. 1937; Geopoliticus Child Art; Reminescence Archeologique de l'Angelus de Millet, 1935; Swans Reflecting Elephants, c.1937; The Disintegration of the Persistence of Memory, c.1954.